- At the top of this window you will find the name of your printer. - The Setup button displays the options available on your printer. 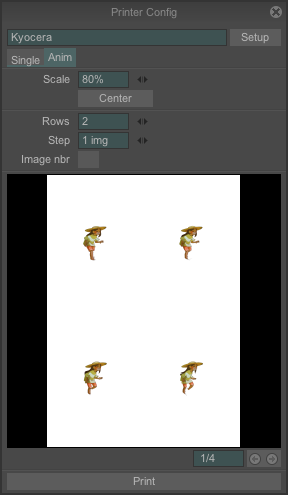 - The Single tab opposite is used to print the current image. 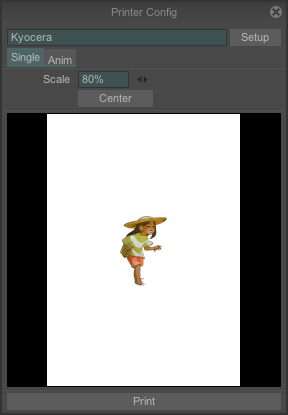 You may adjust the size and position of your image on the future sheet of paper using the click and slide function as well as the Scale field. The Center button places your drawing in the center of your future sheet of paper. - Choose the number of rows for your images. - Display the position of each image on the timeline. - Choose every second, third, fourth, etc. image in the Steps field. The two buttons in the bottom right-hand corner of the panel are used to scroll through the various pages to be printed.